One of the reasons why players often struggle with their fairway woods is that they treat them too much like irons. 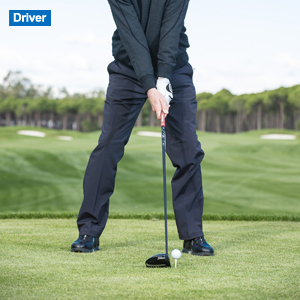 By setting the ball towards the centre of your stance, you'll create an angle of attack that is a little too steep. This will have a detrimental affect on both the strike and the flight. You need to think of your fairway wood more like a driver. 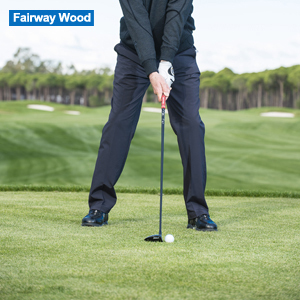 With the ball teed up and your driver in hand you should be looking to strike the ball slightly on the 'upswing'. This will deliver the optimum trajectory to maximise your distance. 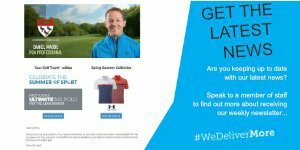 With a fairway wood in hand, you are looking to find a sweeping strike with a shallow angle of attack so the ball should still sit ahead of centre in your stance (not quite as far forward as with the driver). One other important point to make is that your sternum should be over the centre of your stance at address. If your upper body is leaning forward or back, you will be changing the angle of attack. The next time you practice this area of your game, take time to ensure these fundamentals are spot on, they really should help you strike your fairway woods better. Alternatively, if you are struggling with your woods and want some specific help, please pop into the pro shop and book a lesson.